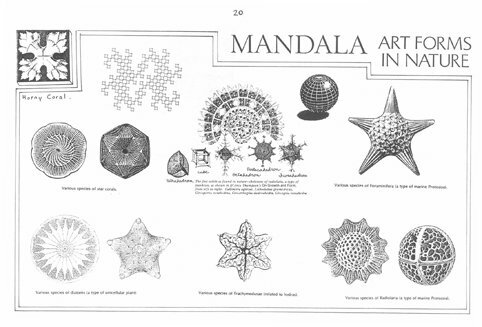 This is a draw-your-own mandala colouring in book for children and adults. It consists of Magic Squares of 3, 4, 5, 6 and 7 selected from European, Essene, Tibetan, and Indian cultures. 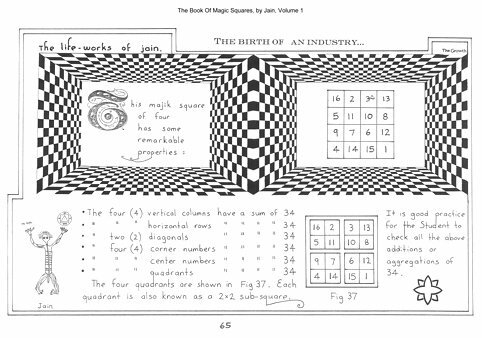 The Magic Square of 3 x 3, which is the centre of the Sino (Chinese)-Tibetan Calendar, when drawn and tessellated produces the atomic structure of Diamond Lattice, confirmed by the clairvoyant chemists Charles Leadbeater and Annie Besant 100 years ago. 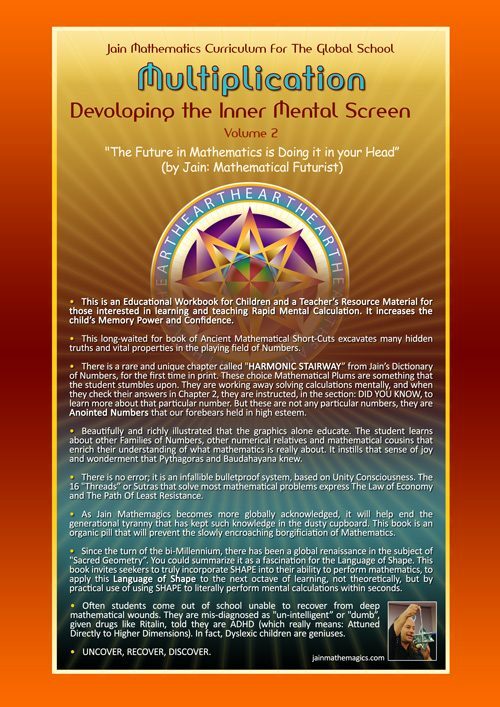 Magic Square Art forms create whole-brain learning as the translation of Number (Left Brain / logical) into Atomic Art (Right Brain / Pattern Recognition) allowing the student to absorb this ancient knowledge subliminally. This book contains 169 photocopied pages, is hand-written, highly illustrated, the book is a golden rectangle but fitted or orientated to A4 landscape , and wire bound. 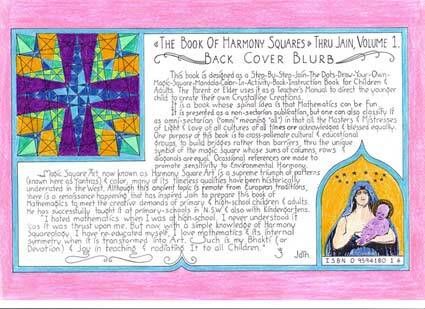 THE BOOK OF HARMONY SQUARES, (ISBN:0-9594180-1-6, ed 1, size A3, perfect bound). 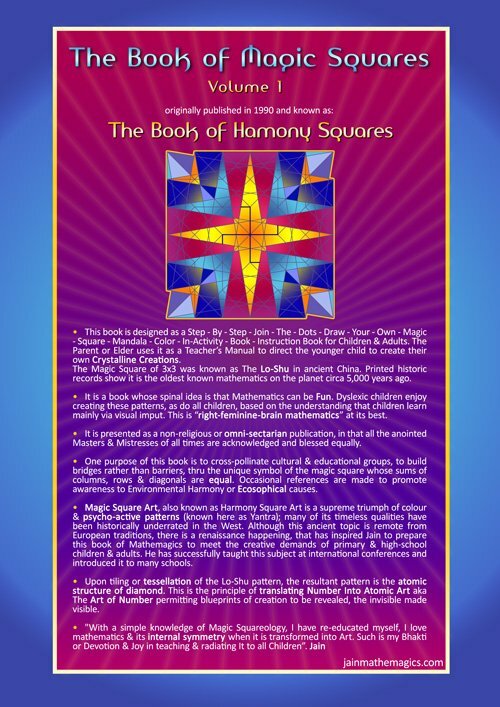 At that time, I gave myself the artistic and intellectual licence to change the word ‘Magic Square’ to ‘Harmony Square’ due to an unusual and fearful response from some Christian based educational institutions who objected to the word “Magic” despite “Magic Squares” being part of the curriculum studies. 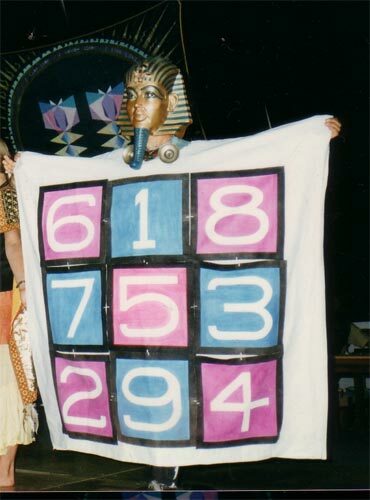 The Magic Square of 3×3 is one of those few ancient and cryptic Number Codes that is, in the mass consciousness. Most people know of it as a card trick, arranging 9 cards into a square ensuring that all sums throughout are equal. Representing Order amidst the apparent Disorder displayed in Life , the “Lo-Shu” (pronounced, “Lo-Su”) is the Centre of the Sino-Tibetan Calendar/Cosmology. The ancient Indian seers referred to the Lo-Shu not only as a Time Calendar but also as a Space Matrix or Code that governed the sacred architecture of their Temple’s blueprint or ground-floor plans. The Lo-Shu defines energetically the optimum Path of Least Resistance, as in the way water flows. Genetic Researchers gene-splicing scientists have now alluded to the magical sum of the Lo-Shu’s 3 columns, 3 rows and 2 diagonals, being 15, as a direct relationship to the 64 possible swatches of D.N.A codons which also displays 64 possible sums of 15. Back in 1962, the famed pair (Francis Crick and Watson) who revealed the helical nature of this molecule, made specific references to the relationship of the Lo-Shu and the Ho-Tu in terms of the number of atoms of the hydrogen bonded paired bases in D.N.A. 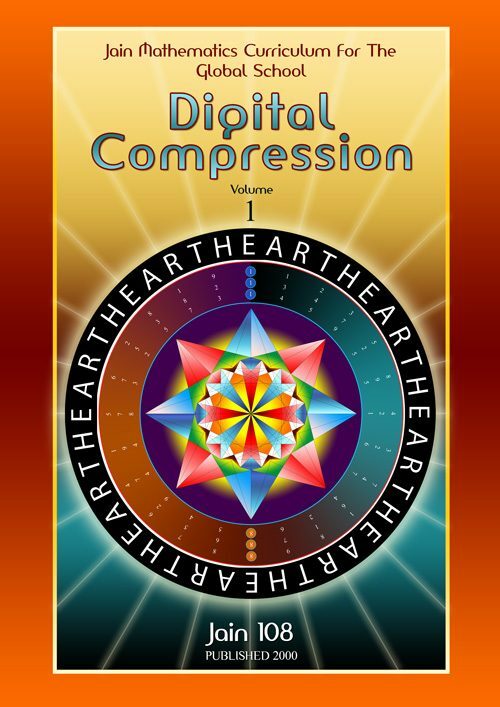 In effect, the Lo-Shu is the simplest blueprint that unifies all complex Life components. Not only is it linked to the workings of the D.N.A molecule but it is part of our Ascension Process. The Latin axiom: “e pluribus, unum” applies here, meaning: “Out of the Many, the One”. Each individual part or cell of any system, whether it be crystal or human must be honoured in respect to the Greater Whole, in all Time, in all Space, unconditionally. Notice that all the pairs around the center of the magic square of 3 have a sum of double the central cell. That is, 1 and 9 =10, 2 and 8 =10, 3 and 7 =10, 4 and 6 =10. Our Society, locally or globally is a Magic Square displaying internal symmetry albeit hidden: each farmer, baker, tradesperson, banker or leader has its specific place in the greater scheme of the Magic Square which is Equality in all dimensions and levels: what is to the left, is the same as what is to the right, As Above, So Below, we are all connected to the Centre. 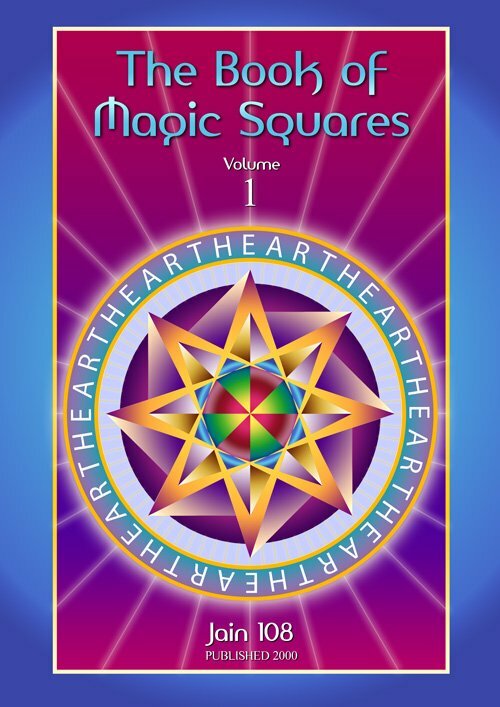 This book is designed as a Step-By-Step-Join-The-Dots-Draw-Your-Own-Magic-Square-Mandala-Color-In-Activity-Book-Instruction Book for Children & Adults. The Parent or Elder uses it as a Teacher’s manual to direct the younger child to create their own Crystalline Creations. 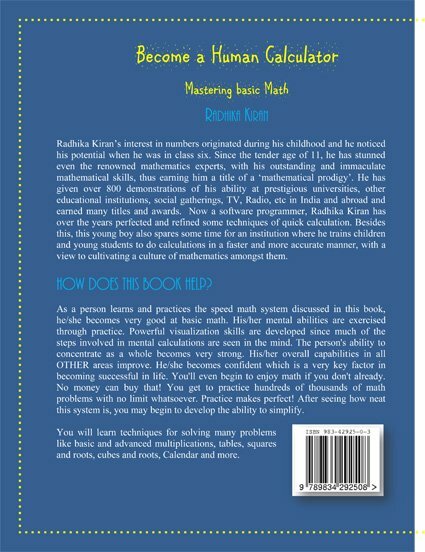 It is a book whose spinal idea is that Mathematics can be Fun. It is presented as a non-sectarian publication, but one can also classify it as omni-sectarian (“omni” meaning “all) in that all the Masters & Mistresses of Light and Love of all times are acknowledged and blessed equally. 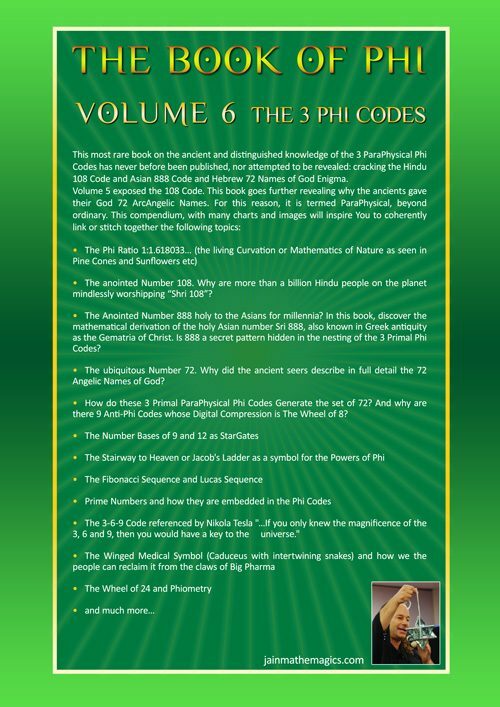 One purpose of this book is to cross-pollinate cultural & educational groups, to build bridges rather than barriers, thru the unique symbol of the magic square whose sums of columns, rows & diagonals are equal. Occasional references are made to promote sensitivity to Environmental Harmony. 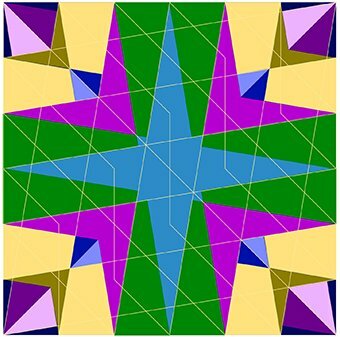 Magic Square Art, now known as Harmony Square Art is a supreme triumph of patterns (known here as Yantras) & color; many of its timeless qualities have been historically underrated in the West. 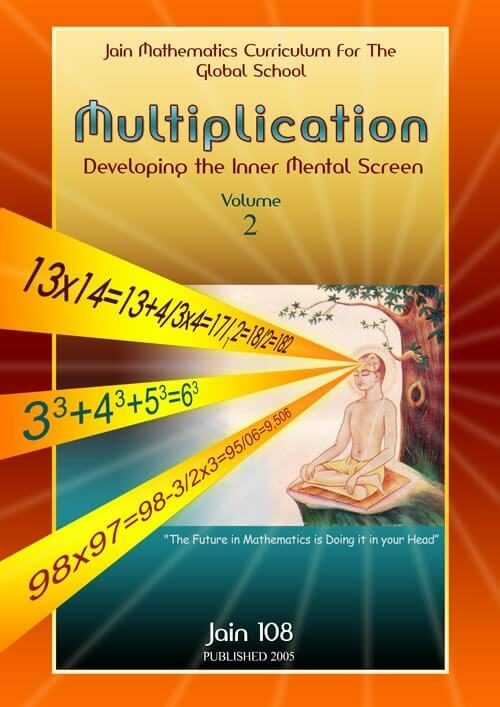 Although this ancient topic is remote from European traditions, there is a renaissance happening, that has inspired Jain to prepare this book of Mathemagics to meet the creative demands of primary & high-school children & adults. He has successfully taught it at primary-schools in N.S.W & also with Kindergartens. 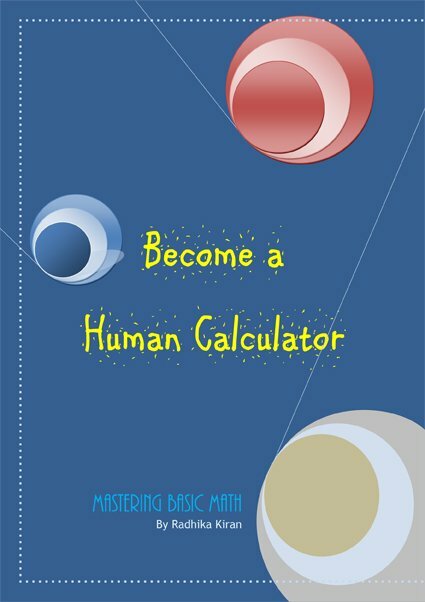 “I hated mathematics when I was at high-school. I never understood it ‘cos it was thrust upon me. 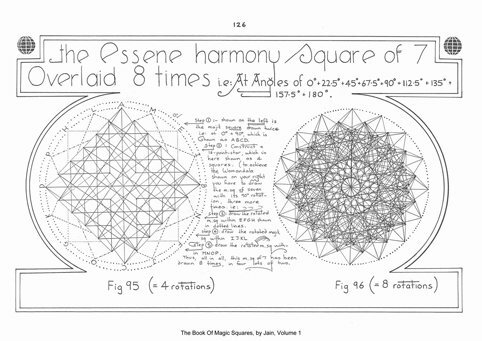 But now, with a simple knowledge of Harmony Squareology, I have re-educated myself, I love mathematics & its internal symmetry when it is transformed into Art. Such is my Bhakti (or Devotion) & Joy in teaching & radiating It to all Children. 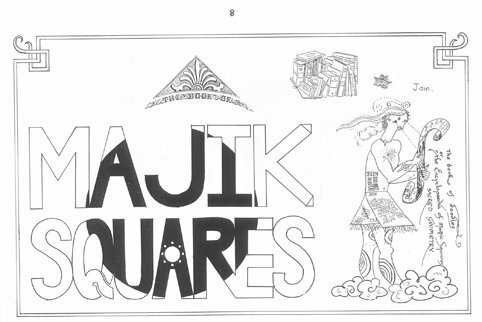 CHAPTER 1: What is a Majik Square? – Introducing The Majik Square of Three (3×3) or Lo-Shu. 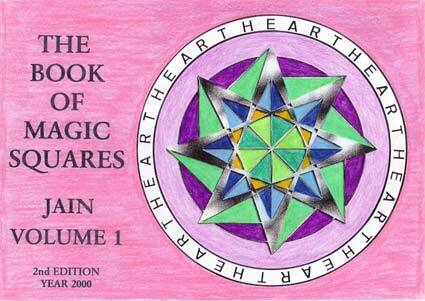 CHAPTER 2: How To Draw Majik Square Yantras. 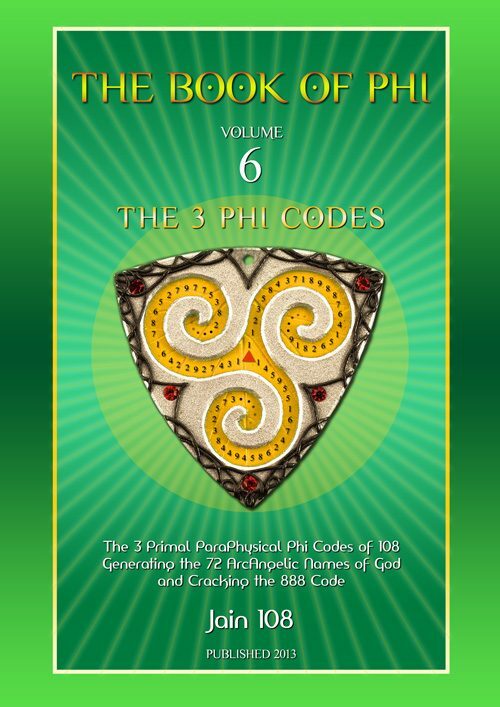 CHAPTER 3: How To Rotate Majik Square Yantras. 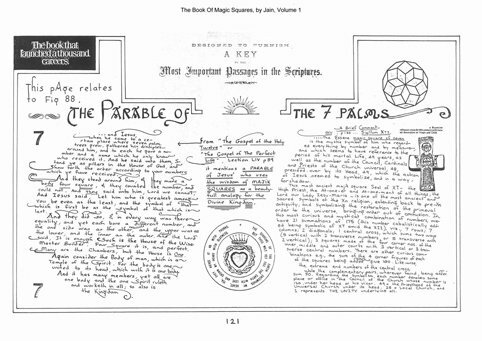 CHAPTER 4: Majik Squares Of The Order Of Four. – The Benjamin Franklin Majik Square of Four. – Indian Jaina Majik Square of Four. – Albrecht Durer’s Square of Four. – Other Majik Squares of Four. –The Essene Majik Square of Five. –The Sufi (Uni-Centred) Square of Five. –Introducing Another Harmony Square of 6. 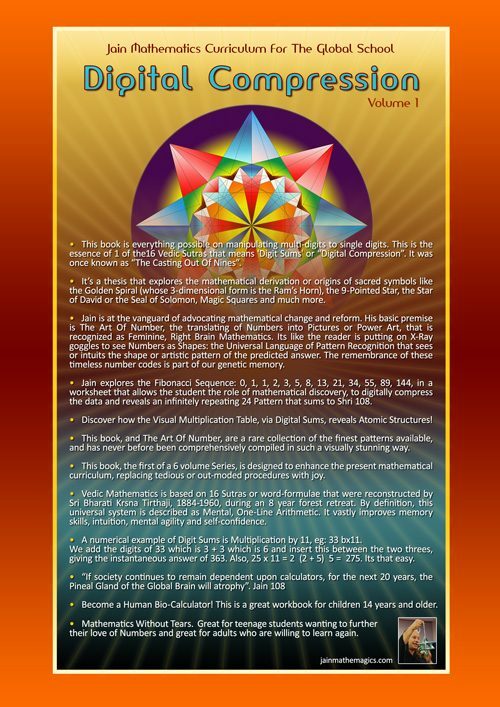 CHAPTER 7: Majik Squares Of The Order Of 7even (7×7). –The Essene Harmony Square of Seven. –The Uni-Centred Sufi Harmony Square of 7. (taken from the back cover). The drawing on the right hand side of this page, is the typical style of my drawings. Here we have a Scribe reading etheric/astral knowledge. 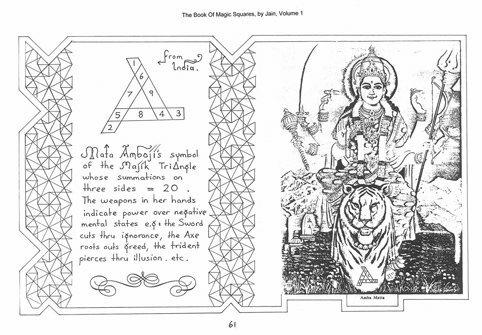 This Goddess AmbaJi has her psychic emblem or mathematical badge as the ancient magic square of 3×3, at the base of her tiger vehicle, in a triangular form. shown here in their exo-skeletal form. Magic Square of 4×4 (Jupiter) with a multi-dimensional border to highlight its importance. This is a typical page showing my unique style of calligraphy, and page layout. Many of my manuscripts were composed whilst I was juice fasting for a month or two in isolation. 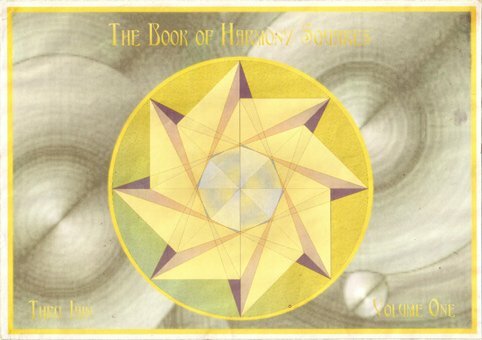 All geometries have been hand-drawn. These designs are as precise as a computer rendered graphic. The Theatre Of The Holy Numbers, performed by Jain wearing a Tutenkahamen mask. creating a ceremony using the Lo-Shu Numbers.